I’ve been wanting to write tutorial on JRuby on Rails for my personal reference but couldn’t really find the time for it. Now here’s a short tutorial on JRuby on Rails that hopefully be useful for you. Set proxy if you are behind a proxy by setting to environment variable http_proxy. Set up your environment variables so you can access the jruby command straight from the console. First set the JRUBY_HOME enviroment variable, then add another entry for PATH variable: $JRUBY_HOME/bin. For this tutorial I use mysql-jdbc driver. 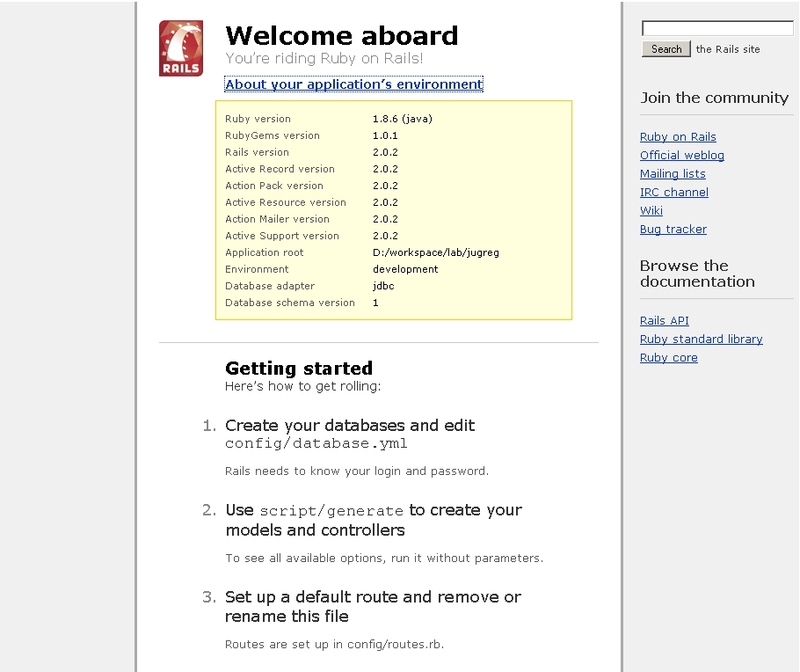 If you can see this screenshot from your browser then you’ve succeed creating Rails project with JRuby. As you can see, the environment is using JRuby implementation and JDBC for the database adapter. That’s all for now. Hopefully it will be useful for you. If you find any difficulties please don’t hesitate to contact me.